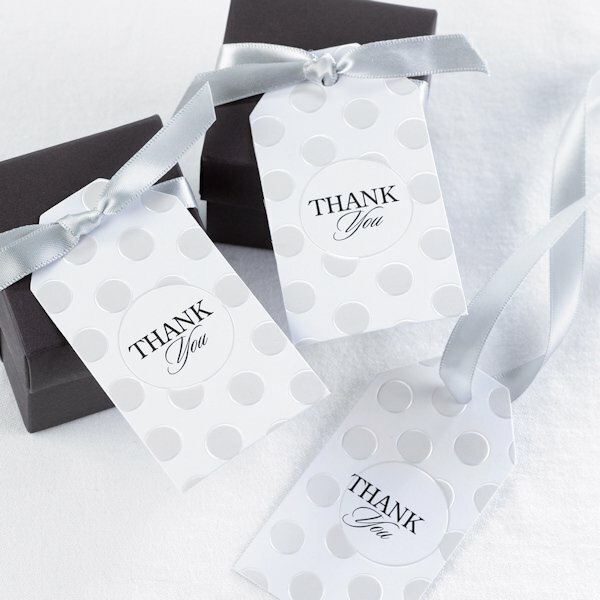 Use these as thank you tags for bridal shower favors, wedding favors, and other event keepsakes! Luggage tag-shaped favor cards are a great way to finish off any of our favor boxes. These particular cards feature an embossed dot design on a pearl white background. The center is imprinted with Thank You in black. Tags are 1.75" x 3.25" and come in packs of 25. Ribbon is not included and the photo shows the tags with our black favor boxes that can be purchased separately. Please note - minimum order quantity is 6.